One of the more interesting aspects of these early months of rock ‘n’ roll has been delving into the backgrounds of its first batch of artists. In the future this will become far less notable because those appearing on the scene in mid-50’s, early-70’s or late-90’s had come of age in a time when rock music was omnipresent, its artistic and commercial merits long established, its credibility as a viable pursuit no longer in question. There was no uncertainty about its future and, in most cases anyway, no alternative pursuit that potentially offered higher stakes, be it fame, fortune or – even as time went on – respect. But at the dawn of rock in the late 1940’s that definitely wasn’t the case. As we’ve already seen on Spontaneous Lunacy lots of those who made early forays into rock ‘n’ roll had extensive résumés in other musical genres. Some of them admittedly had struggled to make names for themselves in those fields and looked to rock as a way to break through, probably feeling they had nothing to lose in taking that chance. But there were some who were highly-regarded in their prior pursuits and were fully aware of just what they were leaving behind to follow this path instead. Tiny Grimes was one such refugee from the jazz world who threw his hat in the ring with rock ‘n’ roll and anyone who knew him… well, anyone who REALLY knew him probably wasn’t the least bit surprised. 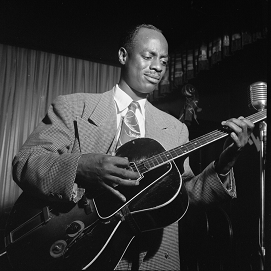 Lloyd “Tiny” Grimes was born in 1916 in Newport News, Virginia and by 1948 was a jazz guitarist with a long track record and a stellar reputation. He’d first gained notice in the late nineteen thirties playing with Cats And The Fiddle, a well-known act that specialized in jivey songs and arrangements. Sort of a novelty group, albeit with some serious chops to back it up. He soon joined Art Tatum’s band, a pre-war powerhouse group featuring Tatum’s innovative piano and a rhythm section anchored by legendary bassist Slam Stewart along with Grimes. 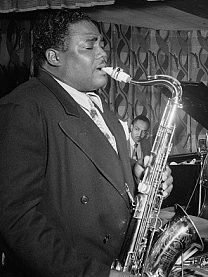 The Trio didn’t stick together long and so Grimes set out on his own, cutting his first sessions as a leader with none other than Charlie Parker on sax. By war’s end there was absolutely no reason not to assume that Grimes would inherit the mantle of the premier guitarist in jazz circles from one of his avowed inspirations, the late Charlie Christian. But Grimes was an iconoclast to say the least, something that could be discerned by his instrument of choice, the rather atypical 4 string tenor guitar. But that was far from his only unusual musical decision in a career that became noted as much for his quirky deviations from the norm as for the stellar music those unpredictable choices produced. Like Earl Bostic on sax who also left a promising career in jazz on the table, drawing scorn and derision for that move, Tiny Grimes seemed almost compelled to follow his own path even if that path seemed more a road to critical perdition than to universal acclaim. Rather than commit himself fully to jazz, maybe helping to broaden the appeal of the newly emerging bop style, or perhaps originating a new movement within the field as he was certainly capable of doing, Grimes abruptly walked away from that idiom, formed a new band and veered towards something else entirely. Something new. Something uncouth. Something like rock ‘n’ roll. Grimes landed at Atlantic Records, themselves a fledging label still without much of an identity, but whose founders possessed a deeper knowledge and respect for figures like Grimes, whose success to date hadn’t quite caught up to his skill and reputation. Atlantic’s strategy was sound, by hiring strong musicians with diverse interests and giving them free reign to create you were at least assured of getting quality music out of them, regardless of its commercial appeal, rather than focusing only on trying to score with whatever trend seemed hot at the moment by grabbing up every talentless dope who claimed to be part of that movement. It’s also quite possible they signed him thinking it’d give them immediate acceptance in the jazz world, a music which company president and founder Ahmet Ertegun was long enamored with. But at his very first session Grimes turns that idea on its head, creating a raw, edgy instrumental that essentially is a musical arm wrestling match between Grimes on guitar and John “Badman” Hardee on sax. 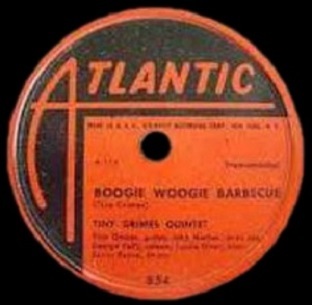 Boogie Woogie Barbecue is miles away from the sedate jazz stylings that could give Atlantic a reputation in that field and instead places them squarely in the juke joint trade that rock was emerging from which, it turns out, is exactly where the label needed to be in order to carve out their own distinctive niche. Atlantic’s legendary production values highlighted by their clear sound mastering, courtesy of engineer extraordinaire Tom Dowd, aren’t apparent yet, so the record has sort of a muffled quality to it, particularly Grimes’s under-amped guitar, like you’re hearing it from outside the club through the open windows rather than with a seat right next to the stage. But what’s unquestioned – and not surprising considering his already well-established reputation – is that Grimes was already laying claim to being the first true rock guitar master. His lines are fast and clean, sharp as a knife, and propulsive, establishing both the melody, and with the lack of any real prominent backing, the rhythm as well. It’s jazzy enough that you know where he cut his teeth, yet he’s not beholden to it by any means. There’s a fluidity to his playing that is mesmerizing, as he goes from one riff to another and yet manages to make them sound as if they were born to be together. Hardee, another jazz refugee, as were so many saxmen over the next decade, answers Grimes melodic questions with emphatic replies, the two of them deftly weaving in and out of one another’s thoughts, yet never getting in each other’s way, never tripping over each other or colliding and sending the entire thing crashing to the floor in a tangled heap. Though the record is smooth in a way sometimes rock had trouble doing, it’s also just raw and urgent enough to firmly establish it as a rocker nonetheless. When the soloing commences, Hardee first, he plays sensually without being explicit, as so many of the sax workouts would soon become. Grimes answers with killer precision with an impressive single string technique before briefly switching to a harsher chording style. The piano keeps up the boogie rhythm, joined by a string bass and there’s some drums faintly in the background, but they’re just in a holding pattern, careful not to intrude on the main proceedings which is the tango between the two leads. Yet for all of their obvious chops, Boogie Woogie Barbecue remains a curiously detached listening experience, lacking the unbridled excitement to give yourself over fully to the song. It could be Grimes was simply too good to play “bad”, or if not bad, at least emphasize the cruder aspects of the instrument in order to turn up the heat even more. So many of rock’s best early instrumentals the intent was blatantly obvious – to get a primal reaction out of the audience, especially on live dates where aesthetic success was largely determined by how packed the dance floor was and how many of those dancing dropped from exhaustion or got so carried away by the rhythms of the music that they shed inhibitions along with articles of clothing as the music pulsed erotically in their ears. Boogie Woogie Barbecue is performance art, not a participation sport. The audience for a song like this is almost compelled to stay seated – and quiet – respectfully watching the musicians ply their trade rather than merely using their work as a backdrop for the crowd’s own carnal pursuits. In that way the jazz mentality remains apparent in Grimes, even if the song itself is more at home in rock ‘n’ roll. But then again, that’s the beguiling nature of much of the music from those who found themselves with a foot in multiple genres at this stage of the game. The artists themselves hadn’t quite figured it out yet so the listener’s responses to what was offered took on greater importance, determining which directions an artist would head in the future. To that end this wasn’t something you’d necessarily seek out, even if you allowed yourself to be temporarily immersed in its steamy atmosphere, and so their plans required some reassessment going forward. Maybe that comes across like half-hearted praise, but I DO like this, or at least admire the skill and effort involved. Moreover I really like that Grimes committed himself to make a go of it in a style that, at this point for sure, had neither the commercial or critical acceptance of his previous realm. That choice unto itself was vital in showing anyone who was paying attention that this music wasn’t something unworthy of interest. So rather than being an odd mid-career diversion, a one-off experiment that failed to connect and soon sent him back to the safer environs of jazz, Tiny kept forging ahead in this style, critics be damned. Like many who turned their backs on so-called “serious” music in the mid 20th century, Grimes’s reputation, or more accurately his stature, never fully recovered. Though he’d veer between jazz and rock and anything else that captured his fancy at any given time, paying little attention to labels that music belonged to, he carved out a distinct, highly individualistic body of work. Yet because he didn’t fully commit to anything that had a name… and a fervent parochial audience that would nourish his legacy in years to come… he’s among those musical free-spirits who’ve been largely cast aside. His modern reputation is that of an eccentric and today perhaps he’s most widely known as being a footnote in the career of others he played with, Parker among jazz aficionados, Screamin’ Jay Hawkins among the rock crowd. But his career was all the more fascinating for this eccentricity as he wound up heading in some unexpected directions going forward, at one point wearing kilts and calling his group The Rockin’ Highlanders. Such flaunting of convention usually get the average person tossed in the nut house, while those in the arts merely get labeled non-conformists and are treated with a measure of healthy skepticism in a world that prefers more rigid categories and safe predictability. Despite committing potential hari-kari to his musical reputation by his unorthodox choices, needless to say most of what he did would always be interesting if nothing else. And that’s what this record is. Interesting. It ultimately may have cost him a lot of respect in jazz circles but judging by the impulsive directions his career consistently ventured into that was probably just fine by Tiny’s reckoning. I feel like you’re not giving Tiny Grimes enough credit here. No matter how hard you think he rocked – and no matter how hard anybody rocked after him – I don’t think anybody ever rocked harder than Tiny on the guitar before him. Even earlier on those Art Tatum records he’s playing in an angular proto-rock style. Leave a reply on "Tiny Grimes: “Boogie Woogie Barbecue”"